In the K-ON! Movie, the 5 members of the Light Music Club travel to London. What was your reaction upon hearing “They’re going overseas”? Toyosaki Aki: Like a parent, I first wondered, “Will they really be OK?”. For these light and fluffy girls, I was indeed worried about whether they’d be able to travel overseas by themselves. Taketatsu Ayana: I was also surprised! “They’re gonna get flung across the border? Though they’re still high school students? www” At the beginning I figured Sawako-sensei would go along with them, but then I learned that there would be only 5 of us at the group reading. I was a bit nervous about the danger of them going to such a faraway place. Exactly what made you two so uneasy about it? Ayana: I was also worried about their English. If, for example, someone got sick, how would they get to a hospital? Or if someone dropped their passport, a bag were stolen, or even if their plane crash-landed or something. Mentally exhausting huh! How was it when actually doing the group reading? Aki: Our fears quickly flew away! I’m just speaking on behalf of us, but our goal became to make the most interesting movie we could. And though it’s a movie, we really aimed to infuse it with the cute and relaxing feeling that defines K-ON!. We wanted to make something that even our long-standing fans could watch without hesitation, I’d say. Ayana: Some of the planned developments really gave a “This is K-ON!, this is how it should be” vibe, while others were way beyond what I would have expected. But above all, it was with a flood of happiness for Yui and everyone else, that we got it all done. An Azusa of many faces. So what sort of things do Yui and gang do overseas? Aki: Hmm… light and fluffy Yui becomes more dependable! Ayana: Even though she’s overseas, Yui’s ability to stay so freewheeling is amazing. I respect that. Aki: In reality, Yui takes it easy at her own pace, but this is her personality no matter where she is. It’s basically the same as when she’s in the clubroom. Aki: But Azunyan really enjoys that, doesn’t she. If she were in K-ON! Season 1, Episode 4, “Training Camp”, where they go to the ocean, she’d want to take care of everything completely, like the way she gets suntanned to the max. I think that it’s actually Azunyan who enjoys the trip the most, wouldn’t you say? Ayana: Definitely! www Azusa really shows off a ton of different facial expressions in the movie. It’s kinda like “Azusa can do this kind of face too! ?” There’s even a scene where her face goes completely red, and she tries to run away- or more like, totally disappear. It must have been the first time she ever turns *that* red. There are also times when she’s spacing out, when she’s all smiles, even angry scenes… I think you’ll really enjoy the many faces of Azusa. Do any other characters show another side of themselves like Azusa does? Ayana: Mio definitely warms up to a more capable version of herself. She usually works diligently to watch over everyone, but this time she really steps up to the plate in a crisis, and saves the day. It’s really cool! So how do the adventures of the “YuiAzu” team go? Aki: Azunyan kinda gets the short end of the stick. Aki: Just kidding. Something terrible like that doesn’t happen. But, Yui truly loves and loves Azusa, and she’ll be stuck to her forever. If 5 girls go on a trip, they’ll have to split up seats on the plane and hotel rooms and such, but one can tell just from watching the airplane scene in the trailer that Yui is glued to Azusa’s side. Because it’s like that, and Azusa naturally has to go along with what Yui does, I think it’s a bit tough for her, isn’t it? Ayana: There are times when you just can’t take your eyes off of Yui. Like a child, or rather, like a pet dog www. I have a dog at home, but if I’m not paying attention, my puppy will often just stir up some trouble. It’s kinda like that feeling maybe. But, there’s no way Azusa truly dislikes Yui’s behavior, I’d say. Aki: Yes, yes, exactly. It always turns back into their usual back-and-forth banter. The scenes when they are together really do become smile-provoking and heartwarming. To watch the movie thinking that even this aspect of their relationship is really cute would certainly bring a smile to my face. Highlights Include the Staff’s Love, and English Conversation!? 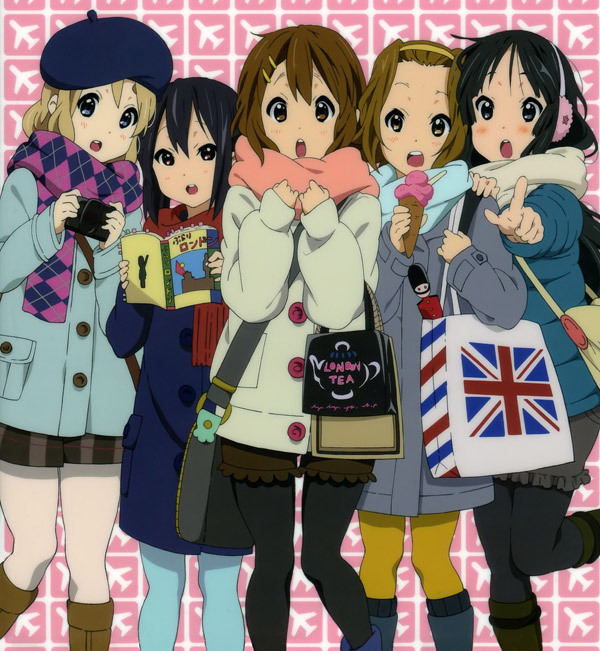 In the movie, Yui and friends go to school, the airport, and various places around London, but do you have a favorite scene? Aki: I’d say my favorite scenes are the ones in England, where the 5 of them try to communicate in English. Watching them talk with the locals and wondering if anything they said was understood, or worse yet, misunderstood, is something I’d like you to look forward to. As a little hint, let me just say that the thing Yui needs the most is not exactly a larger vocabulary www. Ayana: It’s hard to pick a favorite… I’ll leave it to you to find out at the theater. Aki: The movie takes place just before the events in the last episode of the TV series, but there are definitely a lot of anchor lines to tie it all together! Ayana: There are plenty of scenes in the movie that provide backstory to events that couldn’t be explored fully in the TV series. Additionally it fills in some gaps, like what a character was thinking about at a certain time. Aki: Whether you refresh your memory by re-watching the series prior to watching the movie, or revisit the series after seeing it, I think you’ll definitely discover something new. The trailer uses the movie’s opening song “Ichiban Ippai”, doesn’t it? Aki: Yui has been tasked with the lead vocals for this song, but unlike the fast-paced, energetic songs she’s had up until now, this one captures that exciting feeling that builds up before a trip. The lyrics are very cute, and I sing the song in a super relaxed, Yui-esque way. Ayana: It’s a song that overflows with happiness and dreams, and listening to it, I really start to feel like how Yui does. It’s like Yui is sitting there, and all around her are the Light Music Club members, snacks, Ui, Giita – basically tons of things that she likes. And in the midst of it all, she’s spinning around and dancing – that’s the sort of image that I get. Just listening to the song, it’s like you’re transported back into the world of K-ON! Once and for all, what are the highlights of the movie? Ayana: The movie is wrapped in the love and effort of the staff. The art is beautiful, and you’ll see sad moments, angry moments, happy moments… You’ll really get to see the different sides and expressions of all club members. All those things are highlights! Please give the readers a final message! Aki: I’d like to strongly express my heartfelt feelings of thanks to all the fans who have supported us to this day. If you could accept even just a bit of this warmth, this feeling, I would be extremely happy. Ayana: If you watch the movie, you’ll get a good idea of what K-ON! is about. So, of course to those who’ve been following K-ON! since S1 or S2, and also to those who are even just the tiniest bit interested in the movie, definitely go and see it. You’ll be able to watch it with pure feelings as if you were back in high school, and really become a member of the Light Music Club, so get those feet to the theater! I’d like to. As soon as I get some more free time I’ll be sure to do some more!